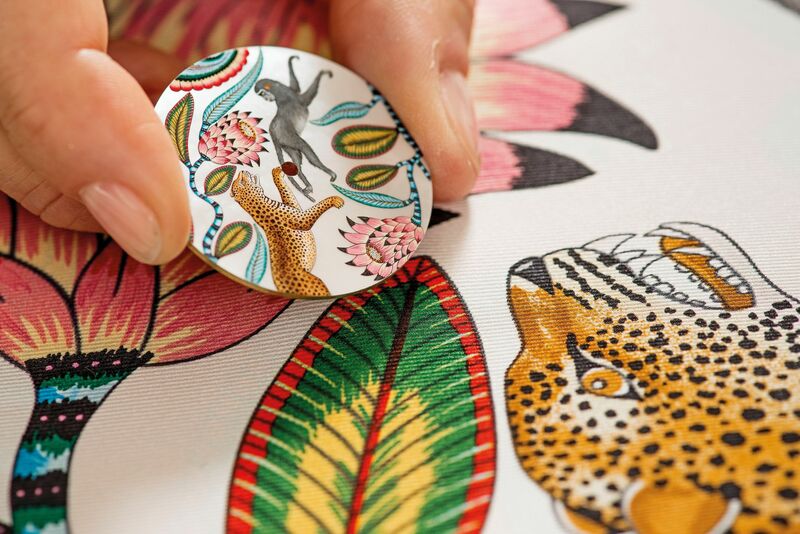 Unveiled earlier this year, the Slim d’Hermès Savana Dance watch features a whimsical scene of a leopard chasing a monkey amidst vibrantly coloured plants painted on a white mother-of-pearl dial framed by a 39.5mm white-gold case. Only 12 are available. Once more, Piaget proves to be the master of stone dials with the Altiplano High Jewellery lapis lazuli tourbillon watch. To create the dial a Piaget craftsman cuts lapis lazuli into slices a mere 1mm thick, polishes them, and assembles the pieces into a stunning dial. The stone marquetry takes as long as three weeks to complete. A tourbillon on the right of the vivid blue dial is balanced by the time on the left, and the face is framed by baguette-cut diamonds set on the white-gold case. The Lady Arpels Jour Féerique watch in white gold features a delicate dial with a fairy basking in the rays of the sun—an image realised in enamel and an assembly of round and rose-cut diamonds, yellow sapphires, spessartite garnets, mother-of-pearl, and turquoise. There is only one of this playful timepiece. This timepiece is one of two unique watches created by Backes & Strauss to show its support for Tears of the African Elephant, an NGO founded to fight the poaching of elephants. The dial depicts an African elephant hiding behind trees. The leaves are hand-engraved and painted with grand feu enamelling, while the elephant is speckled with diamonds, its eye a brilliant-cut emerald from which appears a teardrop made of gold. To celebrate the 50th anniversary of the Golden Ellipse, Patek Philippe’s oldest model after the Calatrava, the brand had its artisans create 100 of this special edition featuring a black enamel dial and an intricate pattern carved and engraved by hand from a block of white gold. The centre of the dial features a motif reminiscent of the Calatrava cross, Patek Philippe’s logo. This Ronde Louis Cartier panther watch features a technique never before seen in Cartier’s timepieces: wood and gold leaf marquetry. A very specialised form of the craft, it involves layering wood veneers over 24 carat gold leaf. The artist also sands or etches the surface to create various details, such as a spot, an outline, or a transparent effect. Peridots are used to light up the panther’s eyes. The Petite Heure Minute Smalta Clara was presented earlier this year to celebrate the brand’s 280th anniversary. The dial of this exceptional piece features pliqueà-jour enamelling, a centuries-old technique that requires a rare level of skill to prevent the enamel from cracking in the kiln. The result is a dial reminiscent of a stained glass window, as the transparent case back allows light to shine through from behind. The Métiers d’Art Les Aérostiers collection pays tribute to the golden era of experimental flying in the 18th century. On the dials of these watches, the maison’s master engravers reproduce miniature depictions of five historical hot-air balloon flights undertaken in France between 1783 and 1785. These vintage balloons are hand-engraved and micro-sculpted in gold, and set against a translucent pliqueà-jour enamel background. This superb LUC XP Esprit de Fleurier Peony Gold watch is not for the fainthearted. Its intricate dial features a peony motif in Fleurisanne hand engraving, the gold theme continuing in dauphine-type hands. Looking beyond the bold gold, you will appreciate the watch’s engraved bridges through its openwork dial.